It’s winter and we need something hearty as we come in from a cold day. Soups have that marvelous quality of warming us up and make us feel good again. There is nothing like a great tomato soup when I’m feeling blue and tired after a hard day’s work to perk me up. I usually take a big bowl of this soup, put on my pj’s, cuddle up in a bed and call it an early night. It makes a great, easy, quick supper when you are in a rush and want to serve something hearty. NOTE: DO NOT REFRIGERATE your tomatoes! Cold temperatures ruin tomatoes. hurting their flavor and their texture. You can cut the acidity of your tomato soup by adding just a tablespoon of granulated sugar at the end of cooking. On a large baking sheet that has been sprayed with non-stick spray, lay your halved tomatoes face down. Drizzle olive oil lightly over the tomatoes and sprinkle a little kosher salt and pepper over them. Place in the oven for about 15-20 minutes. Remove from oven and set aside to cool. when the cooked, chop up up the tomatoes into small chunks. In a large soup pot heat the olive oil and saute the onions for a few minutes. Add all the spices to the onions and mix them well, making sure the onions are well cooked. Saute for another minute or two. Add the carrots to the onions and mix wel,; cook gently for 5 minutes and then add the chopped tomatoes and tomato juice. Bring the soup to a simmer and then add the vegetable stock and the couscous. Bring the soup to a full boil and cook until the couscous is soft and tender (about 20 minutes). Add salt and pepper to taste before serving. Soup is the perfect winter comfort food, warming us after a cold walk or simply enjoyed… because. In all its myriad incarnations, and ingredient variations a good soup warms the heart and soul as it satisfies the palate. [..]A simmering soup can fill a house with wonderful, inviting aromas. It can invoke memories of childhood dinners, surrounded by family, which none of us seem to have time for anymore. From Parve/Vegetarian Soups like Everything But the Kitchen Sink, or Beet Borsht to Dairy Soups like Baba’s Break the Fast Soup, or Beer Cheese Soup; from Fish Soups like Saffron & Garlic Fish Soup, Soupe de Poisson au Provence to Meat Soups like Za’atar Chicken Soup, or Lamb & Fruit Soup, from Fruit and Dessert Soups like Pear Soup with Feta, Pecans & Balsamic Reduction or Chocolate Soup to Accompaniments like Matzo Balls with Fresh Herbs, or Parmesan Croutons this cookbook has it all. Every recipe shows its nutritional values which is great for any weight conscious foodie. With over 150 soup recipes and 6 accompaniments, this is the perfect book for the perfect comfort food! First published in 2004, it is now in its second edition with over 20 new recipes. Pam Reiss is constantly improving her work making it bigger and better. This creamy soup makes a great dessert. 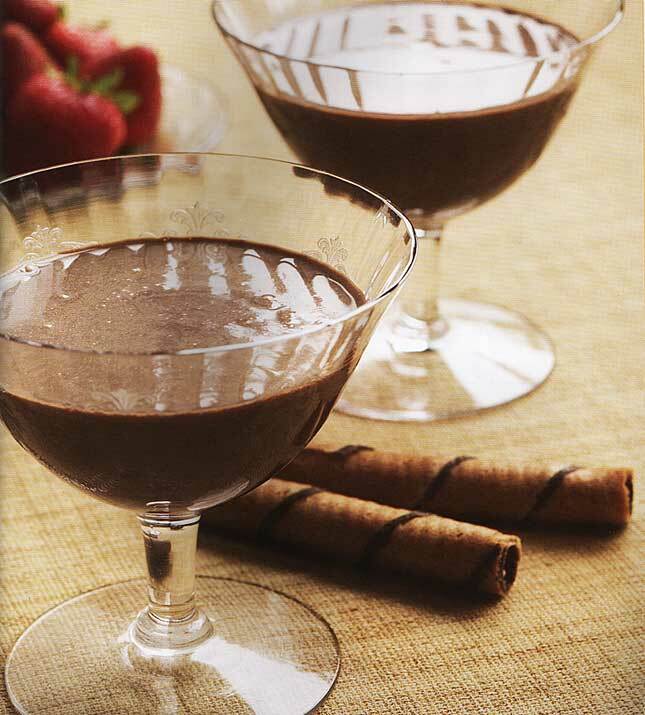 Serve it with a little fresh-whipped cream and some sliced strawberries, or use it as a cold chocolate fondue. Guests will be surprised when you serve this one! In a mixing bowl, wisk together the granulated sugar and the egg yolks until frothy and butter colored. Using a double-boiler (or place about 2 inches of water in a saucepan, bring to a light simmer and place a metal bowl over it), heat the half-and-half, milk, salt, chocolate and cocoa powder until all of the chocolate is melted and the mixture has warmed through. Slowly add some of the hot chocolate mixture, about 1/2 cup, into the egg/granulated sugar mixture, whisking as you pour it, so that the hot liquid is incorporated right away and the eggs don’t scramble. Slowly poutr this mixture back into the hot chocolate, whisking as you pour. Continue to heat the soup until it has thickened slightly, 3 to 5 minutes, whisking continuously. When you dip a wooden spoon into the soup, then drag a a fingertip through the coating on the spoon, the line should remain clean. Transfer the soup to a bowl or container, cover with waxed paper and refrigerate at least 4 hours, or until the soup is completely chilled. 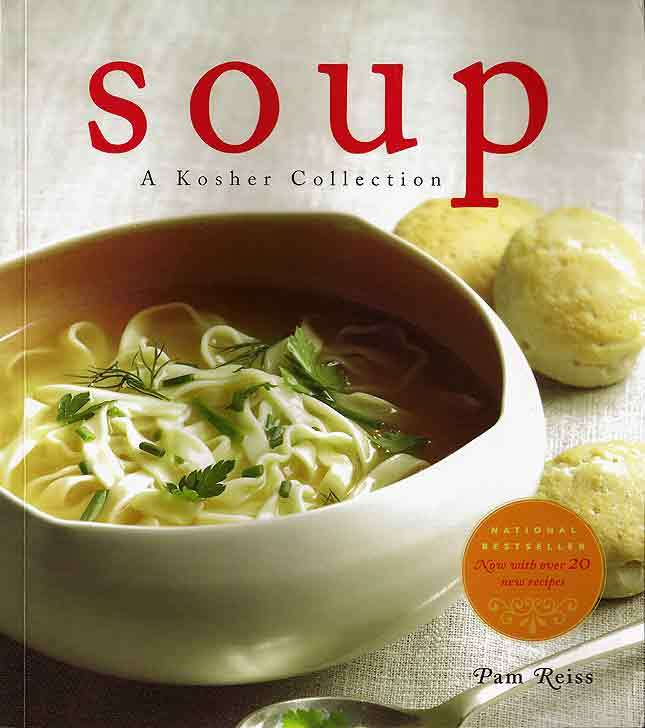 We’ve reviewed Pam Reiss‘ Passover – A Kosher Collection on these pages before, at the time I wrote, the lady can cook!!! The current book strongly reinforces that notion.